Wondering what the best weight loss diets are? With so many diets out there promising this and that result, it can be tough to know which one to try. There are pros and cons of each diet, so it’s important to understand each one and how it would work with your body. To make it a little easier, we’ve rounded up 7 weight loss diets, so you can compare them and try them out for yourself! Most of these diets have free online weight loss programs and meal plans available so you don’t have to spend money to lose weight! We’ve packed in some of the best meal plans for women so you can feed your body exactly what it needs. Portion size is key factor to keep in mind, no matter what diet you choose. Portion sizes have been getting bigger and bigger in North America, especially in restaurants, but in the home, too. Eating smaller portion sizes is one of the best things you can do if you want to succeed in a quick weight loss program. Take a look at 7 of the best weight loss diets! Perhaps one of the most well-known diets out there, the Weight Watchers diet has evolved quite a bit over the years. Its most recent points system goes by the name of SmartPoints, which assigns points to foods based on their calorie and nutritional content. Protein lowers the number of SmartPoints, while sugar and saturated fats increase the points, so obviously, the lower the points the better. With the Weight Watchers system, you still get to eat really yummy food. The focus is on helping you eat healthier meals with whole foods such as fruits, vegetables and lean proteins, and eliminating refined sugar and other harmful ingredients. The points system is intended to help you control your weight in a way that influences your lifestyle so you can feel better overall. Want to know more about the Weight Watchers diet for beginners? Here are 50 delicious Weight Watchers recipes to get you started with Weight Watchers SmartPoints! The Whole30 diet plan is a basically a lifestyle re-charge. The intention is that after 30 days of intentional, healthy eating, you’ll change the way you eat for the rest of your life. The diet was created to enhance your relationship between your body and the foods you eat. The focus isn’t on counting or restricting calories, it’s simply on eating foods that make you feel good, rev your metabolism, and increase your energy. Cut out foods like sugars, grains, dairy and legumes (the ones that are precursors for digestive issues, low energy levels, skin issues, etc.) and increase good-for-you foods like fruits, vegetables, unprocessed meats, seafood, nuts and seeds. If you’re new to the Whole30 Diet, check out this 1-week kick start guide! If you’ve been wondering about the ketogenic diet plan for weight loss, listen up! The keto diet is one of the best ways to slim down in a healthy way. It’s a low carb diet created to suppress your appetite and force your body into a metabolic state. You should be getting 10% of your energy from carbs, 15-25% from protein, and 70% or more from healthy fats like avocados, fatty fish, edamame and chia seeds. Here’s a 7-day keto meal plan filled with some of the best weight loss recipes to get your started on the right foot! The amount of people I know going vegan increases every day. The vegan diet is a fully plant-based diet, meaning no animal products whatsoever. This not only includes meat, but dairy products as well. A typical vegan diet consists of veggies, fruits, grains, beans, legumes, and soy-based proteins like soy milk and tofu. If you’re thinking about going vegan, you have to make sure you get enough protein. A lot of people get their protein from eggs and meat, so it’s important to up your protein intake. You can get protein from foods like tofu, lentils, tempeh and nut butter. The great thing is, with so many people transitioning to a vegan lifestyle, there are tons of delicious vegan options! If you’re interested in learning more about the vegan diet for beginners, take a look at over 50 easy vegan meals! The low carb 1200 calorie diet plan consists of, you guessed it, 1200 calories per day, split between 3 meals and 2 snacks. An example could be that each meal is 350 calories, and two snacks that total 150 calories. Each meal and snack is also supposed to be under 25 grams of carbs. The goal is to rid your meals of unhealthy carbs like pizza, pastries and white bread, and increase your good carbs from foods like vegetables, salmon and eggs. It can be a little overwhelming to know exactly what adds up, so here’s a sample 7-day 1200 calorie meal plan you can follow! The carb cycling diet is quite simple. You eat more carbs on some days and less carbs on others, cutting them out when you don’t need them. High carb days should be the days you perform full-body weight lifting workouts since they aid muscle growth and performance. Low carb days should be days you do cardio as they help with weight loss. On low carb days you cut out the carbs, but eat proteins, vegetables and healthy fats. And on high carb days you can add good carbs like whole grain bread and pasta, beans and lentils, and quinoa into the mix. Here’s a look at carb cycling through a 7-day carb cycling kickstart meal plan! Inflammatory foods can cause weight gain, digestive issues, skin problems and even diseases such as diabetes. They range from foods like peanuts to white sugar, to deep fried foods and foods that contain artificial chemicals and sweeteners. The anti-inflammatory diet will help you feel more energized and healthier all around. It’s filled with foods like leafy greens, fatty fish, veggies and fruit to ensure your body doesn’t become inflamed. Check out this 7-day anti-inflammatory meal plan to see how to best eliminate inflammatory foods from your diet! These 7 weight loss diets are some of the best out there! They not only help you lose weight, but feel better all around! 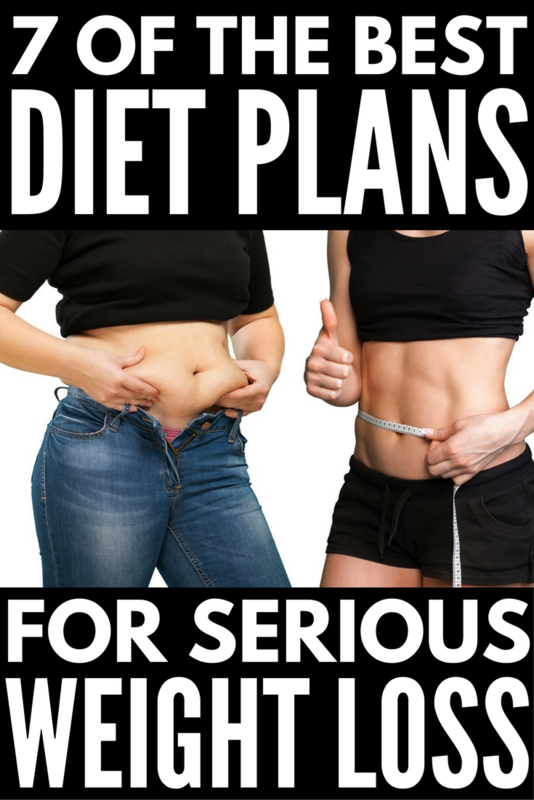 If you liked this overview of weight loss diets, please share this post on Pinterest! And if you’re looking for more healthy tips and tricks, please follow our Health board on Pinterest!